ENGINEER ( A ) Dept. of Urban Affairs, Kerala Govt. Shine Builders Consultancy continues to meet the challenge in conceptualizing and implementing innovative cultural concepts for the millennium. Our projects strive to enrich experience of space, light, context, materials and craftsmanship through the experience of architecture. 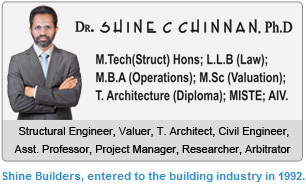 “S H I N E builders consultancy ” has built an excellent reputation by engineering diverse and technically challenging..
Fee structure of our services will vary according to the type you want to purchase which are as follows. Shine Builders Consultancy as project managers, structural designers and architects with dazzling track record of more than two decades, our perfection in making homes of your dream, encourages us to reach you with an excellent range of villas, flats and commercial buildings. Knowing your taste, we create homes that perfectly complement you. We believe in total solutions and undertake guidance everything bound building. We commit ourselves to give, our valued customer, their money's worth. 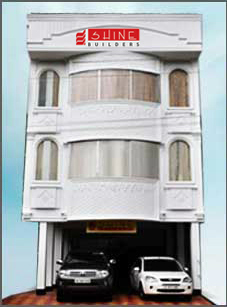 Shine Builders consultancy, entered to the building industry in 1992. Shine Builders consultancy continues to meet that challenge in conceptualizing and implementing innovative cultural concepts for the millennium. Buildings must reflect the traditions and philosophy of the people. The living space as a whole must foster a sense of community and inspire excellence. Every home we design is tailored to fit your family, and every house is built with the personal touches that make a house a home. Shine builders consultancy have performed medium sized projects also. We provide very quick and efficient planning of our projects with full vigor at any given point of time. Clients are our partners. We listen, anticipate and respond by providing solutions to client needs and expectations. Our associates are well versed in all aspects distinguished by their functional and technical expertise combined with their hands-on experience, thereby ensuring that our clients receive the most effective and professional service. We make sure that personalized attention & supervisions is given to all projects, and this is the key success. To best serve our clients, the firm continually evolves, keeping abreast of regulatory requirements, construction costs, sustainability, and new technology, yet always staying focused on our tradition of excellence. Working closely with each client throughout the design process and beyond, we define goals, overcome obstacles, formulate creative solutions, respond to changing needs, and bring the client´s vision .We have fully equipped home theatre system to design the project or proposed house with presence of our clients. They can express their opinions and suggestions at the designing moment itself. Clients can come with their family and friends to the SHINE builders designers home theatre. We provide our customers with unbiased opinions and latest news from the Real Estate, Architecture, Structural, Project management, Interior Designing and Construction sector and more! We pay close attention to all details of the design and listen to the requirements set forth by our clients, resulting in our meeting promised deadlines for each and every project. As professionals in the industry, we are knowledgeable of all facts of the design and construction process.